I’ve sponsored a lot of blogs in the almost two years I’ve been blogging and have also had a lot of businesses and shops sponsor this here blog. One of the things I have always taken pride in is really getting to know my sponsors; I don’t want to be a transaction over the internet, I want to be a friend and genuinely get to know them and help them do whatever it is they are looking to do. After receiving feedback from past sponsors and a few gals on Twitter, I’ve totally revamped my sponsor options and cannot wait to share them with all of you. But before I start, I want to explain to you why sponsoring is so important, aside from gaining exposure and followers. 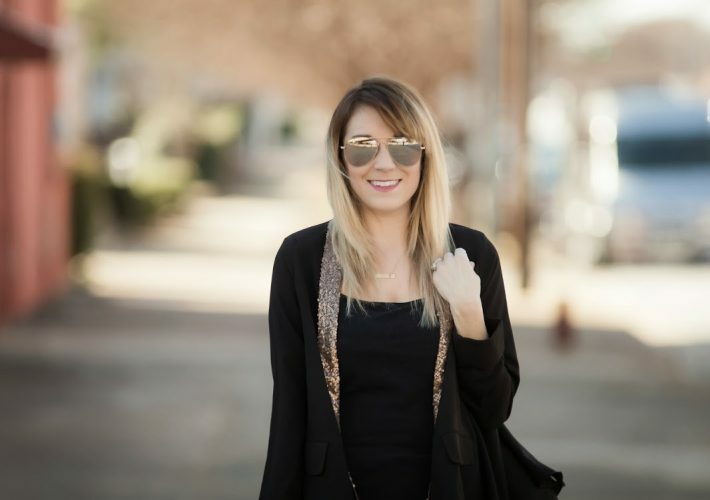 When I first switched from WordPress to Blogger, I immediately felt a sense of community. I was welcomed in, began swapping ads, and slowly getting to know other women who were doing the same thing I was. Having a successful blog takes a lot of time, patience, and talent but even above all of those things, it takes forming genuine relationships in order to gain readers. Anyone can join a group giveaway and gain followers, but it’s the readers that make it worth your while. These options for sponsorship are all designed to help your blog or business grow, but I also want to form a relationship with you and cater to your needs. I have seen so many bloggers make their way to the top and forget what it’s like to just be starting out. Whether you have 5 followers of 5,000 followers, I want to give you and your blog the best exposure I possibly can. You can see which space comes with various options above, but let me explain what each of them mean. Guest post: You take over my blog for the day; it can be anything from a recipe, to a DIY project, to a heart-to-heart about your kiddos. As long as it represents you and your blog, it’s fair game. Collaboration: You and I will work together to write a post on whatever topic we choose. In the past, I have written collaborations on anything from fashion apps to Christmas movies. 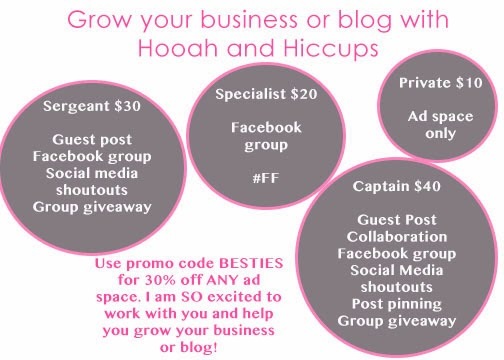 Facebook group: Access to the Hooah and Hiccups Facebook group. Any sponsor that purchases an ad with this option will be invited to join. We can offer each other support on giveaways, help promote posts, ask questions, etc. Social media shout outs: I will be reading your blogs and sharing posts that I think others would like to know about. Depending on the content, it may be anywhere from 1-3 times per week. Post pinning: I will pin 1-3 of your posts to Pinterest each week. With the growing popularity of Pinterest, I think it’s important to utilize this form of social media in addition to all of the rest. #FF: Mention on Twitter every Friday. Group giveaway: You will have the option to participate in the group giveaway. I haven’t organized group giveaways on the blog in a long time but feel that it’s a great way to discover new blogs, not just gain followers. We will collectively choose what we would like to giveaway and it can be as small as an eyeshadow palette or as large as a gift card to a store. I don’t want this to be a way to just gain followers but rather tie in with our collective interests and find readers through the exposure. I have thought long and hard about these new options and I really hope they will benefit all of you! To get started, I am offering 30% off ANY ad space with the code BESTIE! If you have any questions, please let me know and I will be happy to work with you. I’m a blogger, just like all of you, and I want sponsorship to be something that makes everyone comfortable about forking over money for a service. I’ve wasted money on blogs before and I never want any of my sponsors to feel like that’s the case. Hope to see you on my sidebar! « Who run the world? BABIES.